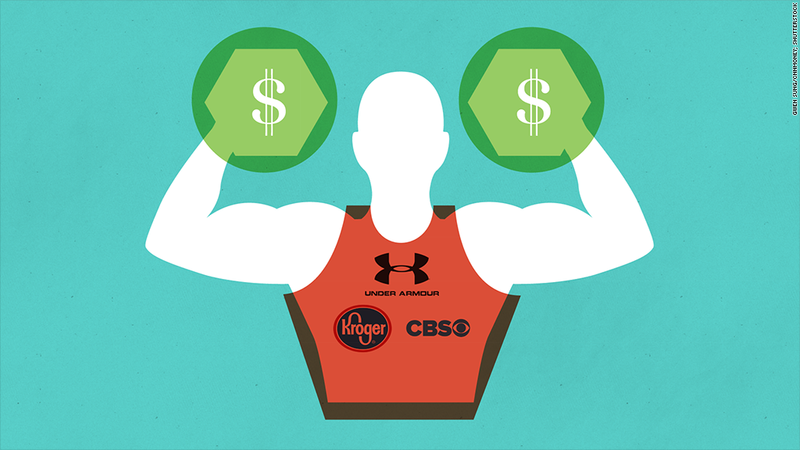 One word sums up Under Armour's earnings: touchdown. The company scored $3 billion in revenue last year for the first time in its history. Under Armour's stock price and market value have risen about 40% in the past year. Its earnings beat expectations...again. Under Armour (UA)'s growth is impressive, especially in a business dominated by Nike (NKE), analysts say. "They're rock stars. It's a great story," says Pamela Quintiliano, an analyst at SunTrust Robinson Humphrey. "They're still trying to get to where Nike is...but I do think they have the opportunity to get there." Under Armour is bulking up for the fight with Nike and diversifying beyond clothing. On Wednesday, the company also announced that it's acquiring two app companies aimed at personal health and fitness: Endomondo and MyFitnessPal. Under Armour already bought a similar company, MapMyFitness, about a year ago. All this comes on top of a big advertising victory Sunday when New England Patriots quarterback Tom Brady, an Under Armour endorser, won the Super Bowl and flashed the company's cleats on TV. Next week could be even better when NBA star Stephen Curry debuts his first Under Armour sneaker before the All-Star game. The Baltimore-based company's shoes, women's clothing and international expansion are its fastest rising stars. Sneaker sales rose 44% last year, while its international earnings more than doubled in 2014 compared to 2013. Analysts say the company's "I Will What I Want" campaign aimed at women is a success. 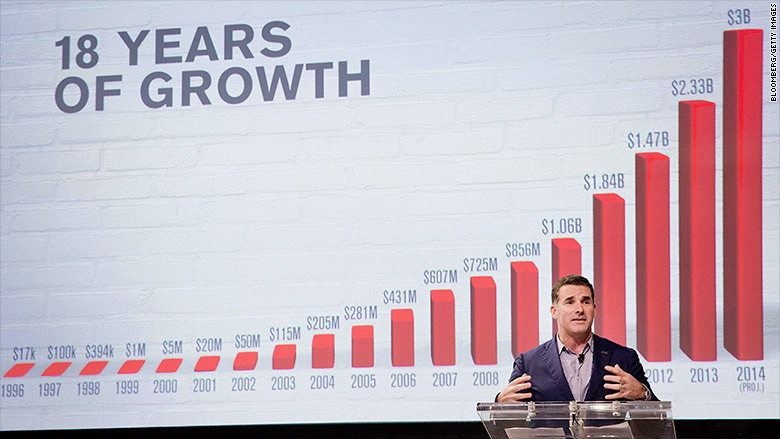 CNNMoney named CEO Kevin Plank as one of the "top performing" in America last year. His focus for 2015 is on international, including translating the retailer's website into more languages. The question is how long Under Armour can maintain the sprint. Wednesday's earnings marked almost five years where it recorded 20% revenue growth in every quarter. While some experts believe the company's stock is currently overvalued at $73, others see Under Armour and its growth as a long-term win for investors. The stock stayed mostly flat in after-hours trading. The company signaled that the strong U.S. dollar, which makes shirts and shorts more expensive abroad, could turn away foreign shoppers in 2015. 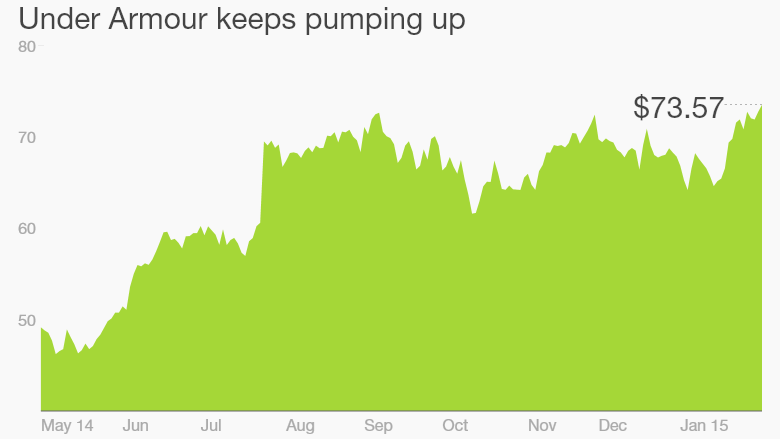 Still, the pressure from the dollar will not change the Under Armour story, analysts say. Related: It's 2015: Where's Nike's self lacing shoes? Under Armour has persevered through the growing pains, says Susan Anderson, an analyst at FBR Capital Markets. "Most people people think they're here to stay. They're not going away," Anderson said. For Under Armour, "it's still the early innings."